Is the geological evidence that locates legendary Troy and Ithaca convincing? For years, people have wondered whether Homer’s Odyssey is at all true. 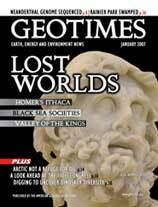 Now, geologists are helping to locate real-world sites in the epic poem, including Odysseus’ homeland of Ithaca. An expedition to the Black Sea last summer led to some surprising discoveries found preserved under the waters, including ancient ships and submerged coastlines. Geophysical techniques and tools, such as ground penetrating radar and magnetometers, help rediscover Egypt’s lost tombs. In the past two decades alone, paleontologists have described as many dinosaurs as have been described since 1824. Researchers suggest that another 1,300 genera may yet to be found. A fifth-grade teacher relates his experiences with NASA's Spaceward Bound program in Chile's Atacama Desert. International Collaboration in Global Science: Price or Prize? The International Year of Planet Earth begins this month. It will challenge the world’s geological community to seek solutions to some of the greatest geoscience-based problems of our age. The geosciences are facing a recruitment predicament in education and the workforce. Geoscientists use lots of specialized words. Could you spell them all? Odysseus, seen here from a museum located in the Villa of Tiberius, Sperlonga, Italy, was the Greek hero of the Trojan War during the Myceanean Age. After a 10-year-long perilous journey, he returned home to his kingdom of Ithaca, which researchers have been trying to locate for millennia. See feature, this issue. Photographed by Robert Bittlestone with the permission of the Soprintendenza per i Beni Archeologici del Lazio, Ministero per i Beni e le Attività Culturali, Roma.